Last week we posted an infographic about how your green industry business can create effective email marketing and that its 3,800% ROI can boost your bottom-line. But your email marketing is only as good as your email list. 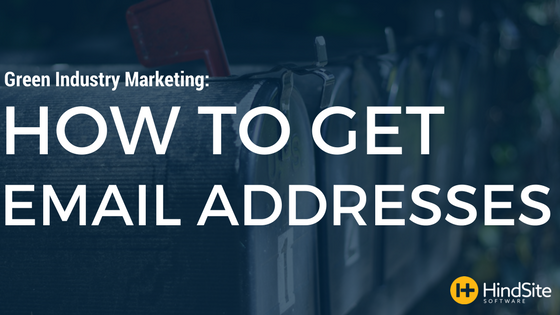 You shouldn’t focus solely on collecting the email addresses of leads. For one it’s usually much easier getting email addresses from existing customers. And you’re almost always more successful upselling current customers than to new leads. But as you’ll see, people will only give you their email address if they think it’ll benefit them. Simply asking for someone’s email while at the same time not offering them some sort of benefit won’t get you far. In a way, it’s like a negotiating. You’re trying to come to an agreement: “give me your email address and you’ll get [blank].” To be effective this benefit must be something people deem worthy of giving up their email for. This can be anything from useful content to a special promotion to a better customer experience. As you’ll see, some benefits are better for leads, some are better for customers and a few are even effective with both. Getting email addresses from leads is much more difficult than existing customers. Compared to other industries, leads in the green industry are less likely looking for useful content - most are merely looking for a business that offers the service they need then comparing prices and reputations. This pretty much leaves you with one option, offering them a discount or promotion. You’re more likely to see results if you’re offering the right thing at the right time. For example, as the weather warms up and spring approaches, an irrigation company could place a discount on start-ups in the sidebar of their homepage. All it would need to say is something like “10% off your spring irrigation start-up” with a place for their email address and a “save me money” button to submit their inquiry. The traffic is already coming to your website all you need to do is have the relevant benefit they’re looking for - then sit back and (hopefully) watch the email addresses roll in. When it comes to current customers you have a few more ways to get their email address and therefore more ways your emails can benefit them. To start, ask yourself a few questions. How can you make their life better? What are their challenges or problems and how can your business help? Offering a benefit that answers one of these questions will not only increase your chances of getting their email address but you’ll also strengthen the relationship by aligning your content with these questions in mind. Besides offering a discount there are two easy ways you can reward customers for providing you with their email addresses. The first is to simply make their customer experience better. This can be anything from paperless transactions like electronic invoices to better communication in the form of timely notification emails about upcoming work. The other way is by sending a monthly - or quarterly - newsletter to customers. The purpose of a newsletter is to provide them with valuable and useful content. Determining exactly what that is can be difficult but focusing on your area of expertise is a great place to start. If you’re like our customers you’ve amassed a good amount of green industry knowledge through the years. If properly conveyed this knowledge can be quite useful to your customers. It can also position you as a trusted source for information. And once you achieve this it’s much easier to upsell your other services. Customers will view it more as a recommendation than a hard sell. Since you’re already communicating with customers there are plenty of contact points where you can ask for their email address. Asking customers as they schedule work is probably the most logical time. Especially if they’re a recurring customer who can benefit from appointment reminders, as is the case for most lawn maintenance businesses. If the customer is seasonal (e.g. blowouts, start-ups) or a one-time project (e.g. installation, design and build), it might be easier to have someone in the field ask for it when wrapping-up their work. Of course, having a place on your website where customers can either sign-up for your newsletter or schedule an appointment is always a solid option. So, which one should you use? Simply the option - or a combination - that works best for your business. When it comes to building a solid email list the key is understanding it’s a two-way street, you first need to give - in order - to get.